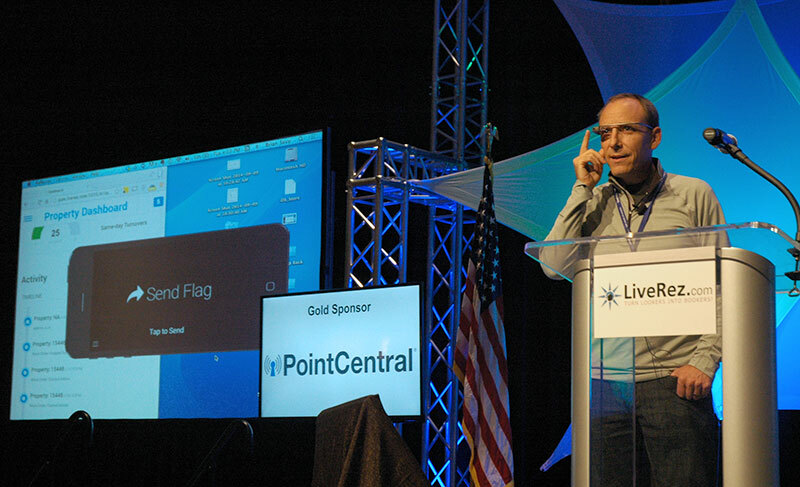 LiveRez VP of Technology Brian Sevy demonstrates the Google Glass app at the 2014 LiveRez Partner Conference in Boise, ID. EAGLE, Id. –– LiveRez.com – the most widely used cloud-based software platform for professional vacation rental managers – has developed a new mobile housekeeping and maintenance app that utilizes emerging Google Glass technology. The announcement of the app and ensuing product demonstration was one of many made at the company’s inaugural Partner Conference last month. The app draws upon perhaps the world’s hottest piece of wearable technology: Google’s smart eyewear project Glass. Calling upon Glass’ mobile internet connection, the app integrates with LiveRez’s cloud-based vacation rental management software to allow maintenance and housekeeping teams to open and complete work orders in real-time without even using their hands. Maintenance and housekeeping teams can open and close work orders with simple voice commands, or even log pictures of issues with Glass’ onboard camera. Glass’ built-in GPS can even sense what property is being worked on. According to LiveRez CEO Tracy Lotz, the app is just another example of how the “Internet of Things” is finding its way into the vacation rental industry. “In the vacation rental business, maintenance and housekeeping teams operate on tight schedules,” said Lotz, a 20-year veteran of the vacation rental industry. “Guests check-in and check-out of vacation rentals every day, and these homes need to be cleaned and inspected between guests. Currently in internal testing, the app will go into field testing when Glass devices are generally available. Glass is currently in open beta, and Google has only recently allowed the general public to purchase the technology. According to Lotz, LiveRez partners could see a non-Glass version of the housekeeping and maintenance mobile app later this year, with the company planning to add in the Google Glass functionality when the technology becomes more mainstream. The app comes on the heels of LiveRez’s recent announcement of its integration with smart home automation leader PointCentral – a partnership that brings the vacation rental home itself online. With its new Google Glass app, LiveRez hopes to bring yet another part of the industry online.